Leopard’s Cover Flow Makes Cleaning and Organizing Your Hard Drive A Snap! I needed a new organizational structure. I know how to do it -- my PC at work is pretty organized -- but I just couldn’t bear the thought of going through my home computer file by file, opening everything to see what it was, and then deciding if I needed it. Does this sound familiar? Then along came Mac OSX 10.5 Leopard, which includes Cover Flow as a new feature in the Finder. Often with a new operating system, you will see new features advertised, and may even see little videos of their use, but they just don't sink in. Maybe you don’t even use the new features, because it is easier to just keep doing things the same way you have been doing them. My stubborn older aunt does this because she is afraid of change on the computer. But I also do this, though I consider myself a “power user.” Then, all of a sudden, I stumble upon some new feature that I embrace. 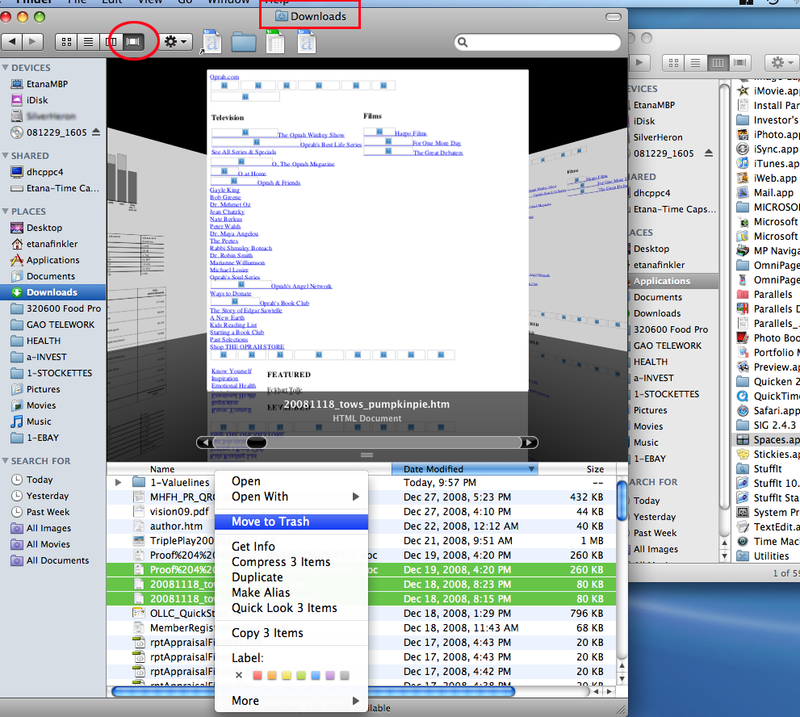 Figure 1: When you open a file in Leopard’s Finder, you have the option of viewing the contents as icons, in a list, in columns, or with Cover Flow. This is what happened to me with Cover Flow this week. I just happened to click on a file while Cover Flow view was selected (see the red arrow in Figure 1), and it was a real "ah ha" moment. I noticed that I could see what the file was. I knew I didn't need that file, so I dragged it to the trash…and didn't stop until I had deleted one gigabyte of unneeded files. I opened two Finder windows, side by side (see Figure 2). In the left window I selected the Downloads folder, and began selecting files and viewing them in the big Cover Flow window preview. I could easily determine whether I wanted to trash or re-file the document. I could easily drag the document in the left Finder window into the appropriate folder in the right Finder window. 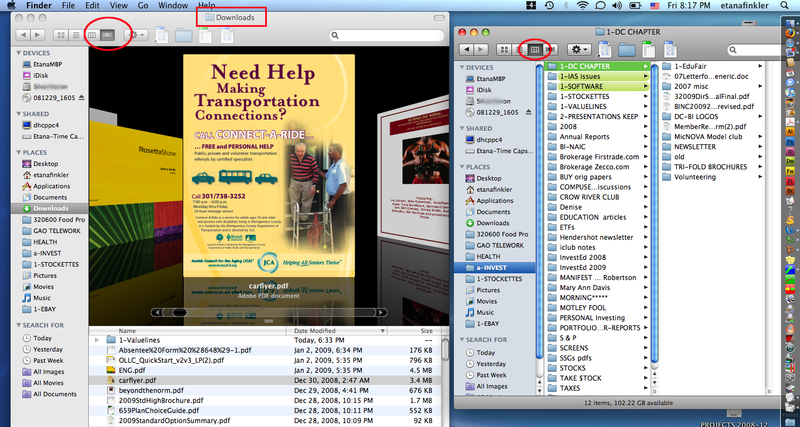 Figure 2: To clean up my files, I opened two Finder windows side by side. In the window on left I viewed the files using Cover Flow; in the other window I selected view in columns. I also found a shortcut: if I chose “Control click” when selecting a file, it brought up a little window with a “Move to trash” option. You can see this in Figure 3. I could look at several files, hit shift click to select them all, and hit the Control click to bring up the menu to send them all to the trash. I just loved emptying the trash of 100 megabytes of junk at a time! And so quickly! Figure 3: “Control click” when a file is selected brings up the “Move to trash” option. I was so thrilled with the ease of the task that, after I had tossed one gigabyte of junk, I went on to reorganize my file structure into something that makes more sense and suits my current needs. Figure 4. I created a TextEdit document to remind me of the date that I reorganized my files, in case I need to find something in Time Capsule sometime in the future. To remind myself of the date of this major reorganization, in case I’m ever searching for something in Time Capsule, I created a TextEdit document (see Figure 4) to memorialize my endeavors. I don’t know if this was necessary or if there’s a better alternative, but I felt that I should do something, since even some file names have been changed.